A few years ago, I had heard a little snippet about Ikigai and thought it was a great way to focus a person’s life. Essentially, Ikigai is the Japanese concept that combines four qualities of a person’s passion and concentrates them into a productive and meaningful life. The four tenets of Ikigai are the things a person loves, the talents where the person excels, the individual’s worldview, and a recognition of where the person can make a difference in the world. At the center of all four of these ideas is the concept of Ikigai. This book is a handy journal that provides some exercises for the reader to help them consider these aspects of their life and how they can find their Ikigai. Each page either has an encouraging quote that ties to one of the four Ikigai pillars or a question for the reader to fill in an answer that will help them understand their Ikigai a little better. The style and aesthetic of this book is relatively chic, which isn’t necessarily a bad thing. While this journal is likely meant to be used on a daily basis, a dedicated reader can probably fill it out in a couple of hours. My one qualm with this journal is that it didn’t guide the reader toward their Ikigai. I already had a bit of a sense of what my Ikigai was, but since the four parts are a little disjointed, it would be hard to pick it out if you didn’t already know it. 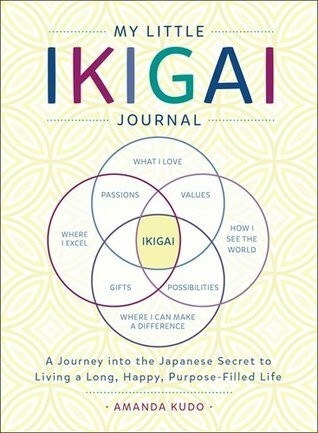 I think it would have helped to have a summary after each section to then pick the strongest element of a person’s life that meets the definition of one of the four pillars of Ikigai, so that way the reader could reach the end of the journal and have a reasonably certain understanding of their Ikigai. An aesthetically chic journal to help the reader find their purpose in life, I give My Little Ikigai Journal 4.0 stars out of 5.